Etulipa – a highly innovative company located in Eindhoven – brings a new electrowetting display technology to the market: bright reflective color displays. The impressive result comes together combining three major innovations in this EWD technology. 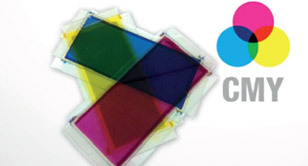 In Etulipa’s EWD Technology, the color selection is performed by three layers of colored oil behind each other (with respectively cyan, magenta and yellow). 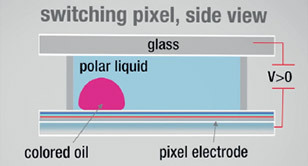 Every layer has pixels which can be switched to absorbing or non-absorbing state. The whole surface area reflects the appropriate component of the light. The result is highly saturated colors. The contrast is great and the colors are brighter than any color ePaper. Electrowetting makes use of the surface tension of the liquids. By applying a low voltage to the cells, the oil spreads or contracts. Depending on the color required, the different layers with oils can be switched on or off, forming various combinations. Since the displays only need small electrical currents they are highly energy efficient (100 times less consuming than LED billboards). 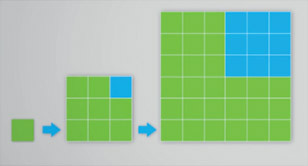 By a special technique, etulipa can combine the different tiles seamlessly. This makes it possible to realize very large billboards that appear as one piece.